Mambalgin-1 was initially isolated by Sylvie Diochot and collaborators from the venom of the black mamba (Dendroaspis polylepis polylepis). Mambalgin-1 is a potent and selective blocker of acid-sensing ion channels (ASIC). ASIC channels have been demonstrated to be implied in pain pathways and appear to be promising therapeutic targets. Mambalgin-1 rapidly and reversibly inhibits recombinant homomeric ASIC1a (IC50=55 nM) and heteromeric ASIC1a+ASIC2a (IC50=246 nM) or ASIC1a+ASIC2b channels (IC50=61 nM) but also human channels hASIC1b (IC50=192 nM) and hASIC1a+hASIC1b (IC50=72nM). Mambalgin-1 belongs to the family of three-finger toxins and has no sequence/structural homology with either PcTx1 or APETx2. Mambalgin-1 differs from mambalgin-2 by one amino acid. Both have demonstrated a similar activity. Mambalgin-1 has no effect on ASIC2a, ASIC3, ASIC1a+ASIC3 and ASIC1b+ASIC3 channels, as well as on TRPV1, P2X2, 5-HT3A, Nav1.8, Cav3.2 and Kv1.2 channels. Fig 1: Dose-response curve of the effect of synthetic Mambalgin-1 #MAM001 on ASIC1a current recorded in Xenopus oocytes. In this system, an IC50 of 21 nM was determined. Product code: MAM001. Category: ASIC channels. Tags: acid sensing, apetx2, ASIC, pain, PcTx1, psalmotoxin. Polypeptide toxins have played a central part in understanding physiological and physiopathological functions of ion channels. In the field of pain, they led to important advances in basic research and even to clinical applications. Acid-sensing ion channels (ASICs) are generally considered principal players in the pain pathway, including in humans. A snake toxin activating peripheral ASICs in nociceptive neurons has been recently shown to evoke pain. Here we show that a new class of three-finger peptides from another snake, the black mamba, is able to abolish pain through inhibition of ASICs expressed either in central or peripheral neurons. These peptides, which we call mambalgins, are not toxic in mice but show a potent analgesic effect upon central and peripheral injection that can be as strong as morphine. This effect is, however, resistant to naloxone, and mambalgins cause much less tolerance than morphine and no respiratory distress. Pharmacological inhibition by mambalgins combined with the use of knockdown and knockout animals indicates that blockade of heteromeric channels made of ASIC1a and ASIC2a subunits in central neurons and of ASIC1b-containing channels in nociceptors is involved in the analgesic effect of mambalgins. These findings identify new potential therapeutic targets for pain and introduce natural peptides that block them to produce a potent analgesia. The synthesis of fluorescent unnatural amino-acid Anap was optimized and the Anap was incorporated into four sites in an acid-pocket or a transmembrane region of human acid-sensing ion channel-1a (hASIC1a). Combinational Anap fluorescence spectra and patch-clamp electrophysiology data illustrated site-specific conformational responses upon toxin mambalgin-1 binding. This combinational approach can be used to analyse conformational properties of many different eukaryotic proteins in their functional states, in a site-specific manner in live mammalian cells. Acid-sensing ion channels (ASICs) are neuronal proton-gated cation channels associated with nociception, fear, depression, seizure, and neuronal degeneration, suggesting roles in pain and neurological and psychiatric disorders. We have recently discovered black mamba venom peptides called mambalgin-1 and mambalgin-2, which are new three-finger toxins that specifically inhibit with the same pharmacological profile ASIC channels to exert strong analgesic effects in vivo. We now combined bioinformatics and functional approaches to uncover the molecular mechanism of channel inhibition by the mambalgin-2 pain-relieving peptide. Mambalgin-2 binds mainly in a region of ASIC1a involving the upper part of the thumb domain (residues Asp-349 and Phe-350), the palm domain of an adjacent subunit, and the β-ball domain (residues Arg-190, Asp-258, and Gln-259). This region overlaps with the acidic pocket (pH sensor) of the channel. 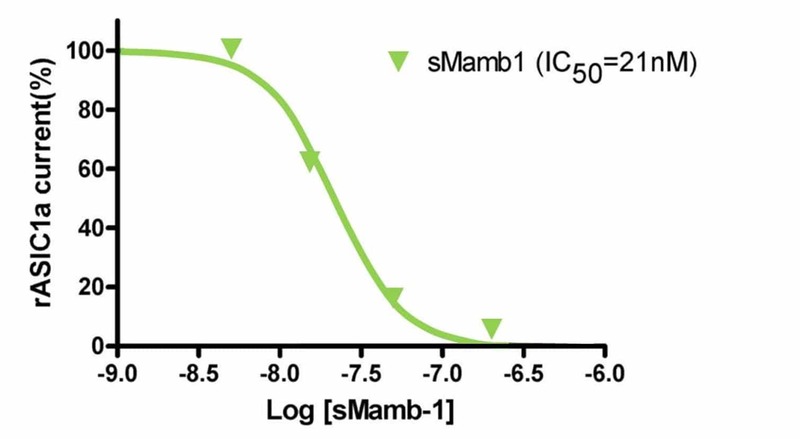 The peptide exerts both stimulatory and inhibitory effects on ASIC1a, and we propose a model where mambalgin-2 traps the channel in a closed conformation by precluding the conformational change of the palm and β-ball domains that follows proton activation. These data help to understand inhibition by mambalgins and provide clues for the development of new optimized blockers of ASIC channels.